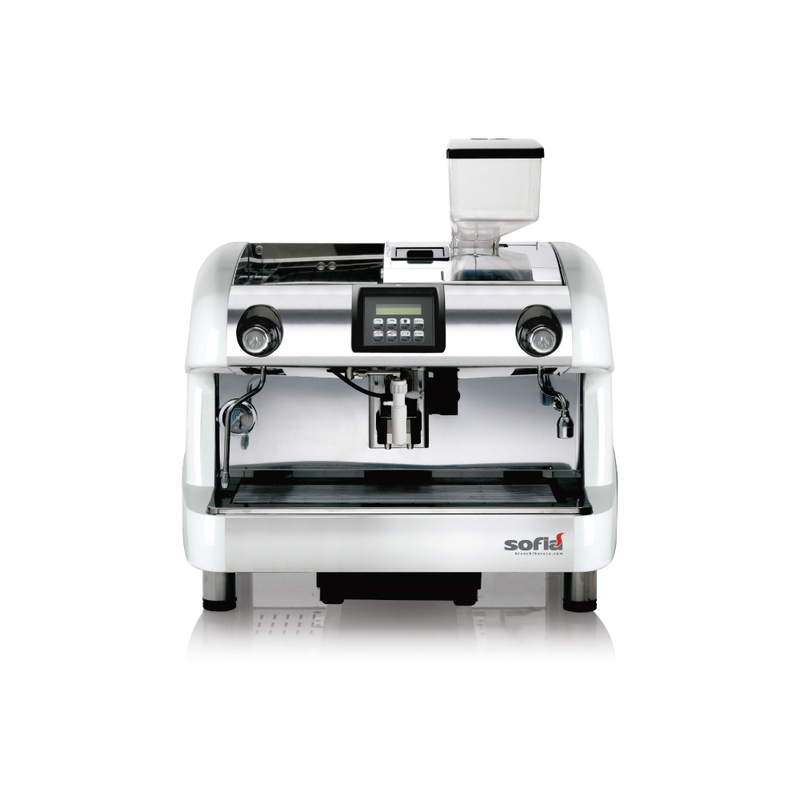 Description : Sofia Super Automatic offers professional barman performances in a completely automatic espresso coffee machine. A simple pressure of the finger is enough and Sofia takes care of everything. Thanks to Bianchis patented coffee group Sofia will pre pare in any anymoment an espresso and a cappuccino of really enviable quality. 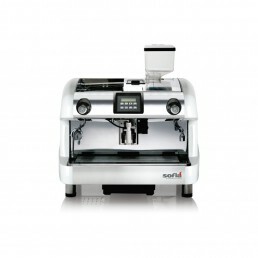 A jewel of technology with precious elements: adjustable quantity of steam for the milk frothing system programmable by means of a keyboard two different pumps, one for espresso coffee and one for boiler filling and hot water service professional boiler, hot water and steam services capacious cup warmer automatic machine installation cycle for boiler filling and automatic boiler resistance management manual funnel for decaffeinated ground coffee coffee group and grinder-dispenser assembly are easily extractable automatic washing of the milk frothing system maintenance operations made from the machine front and the possibility for the Roaster to keep consumptions under close control through the audit data, that can be downloaded with VSP (Visual Smart Programmer) or Flash Key and processed on PC. All the electrical components are suppliedat 24Vdc, with the exception of the boiler resistance, the pumps and the pressure switch that are at 230 Vac 50 Hz. Coffee bean hopper capacity: 1,5 k; Coffee grounds waste tray that can contain up to 50 pods with automatic warning on the machine at the 50th coffee; adjustable quantity of steam of the automatic milk frothing system adjustable by means of programme; dispensing nozzles pre-settable at four different heights (7 8,5 10 11,5 cm from the base). Semi-automatic sanitization of the coffee group. Semi-automatic cleaning cycle of milk frothing system. Selection keyboard with 8 push buttons for: espresso coffee, long coffee, milk (for use of automatic milk frothing system, that allows various combinations such as milk, latte macchiato and caff macchiato), cappuccino, double espresso coffee, double long coffee, americano(espresso + added water), Stop/reset (to stop dispensing of selection in any moment). Instead decaffeinated coffee can be used in combination with the various types of single beverages in alternative to the espresso.Two standard languages installed in the machine,with the possibility to create personalized message file through specific software. 16 digit alphanumeric LCD display for two lines. For autonomous pump. Visual Smart Programmer that allows the upload of the firmware and the settings and the download of the settings and audit data without a PC. Possibility to install a clock chip for the control of malfunctioning and possibility to program automatic cleaning cycles or machine stand by periods. Automatically SOFIA model is equipped with mother board in SMT technology with 16 Bit flash microprocessor programmable with software in Windows environment for PC or with Palm PC (Visual Smart Programmer). Possibility for the Roaster to keep consumptions under close control through the audit data, that can be downloaded with Visual Smart Programmer or Flash Key and processed on PC as well as standard settings (DCC Direct Coffee Consumption function allows to visualize in the menu, in direct mode, the number of cycles effected by the coffee group for an easy count of the coffee bean consumption).